Vincent Perez directs this historical drama adapted from Hans Fallada's novel. 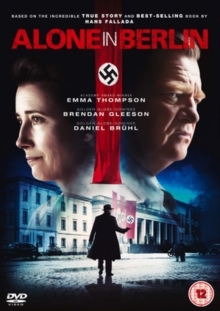 The film follows the story of working-class couple Otto (Brendan Gleeson) and Anna (Emma Thompson) as they wage an anonymous propaganda war against the Nazis in 1940s Berlin. After receiving news that their only son has been killed in battle the parents are left devastated and angry, blaming the Nazi regime for his untimely death. Looking to get some form of revenge, Otto begins inscribing blank postcards with anti-Nazi rhetoric and leaving them in public places across the city. It's not long before word spreads of the secret resistance movement and police inspector Escherich (Daniel Brühl) is appointed to lead a city-wide manhunt for the mysterious scribe.